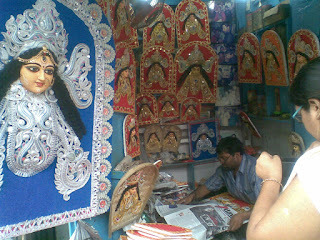 Kolkata to see the Puja. We were suppose to leave for Ajanta Ellora on Sasthi i.e. 6th day on 24th September 2009. 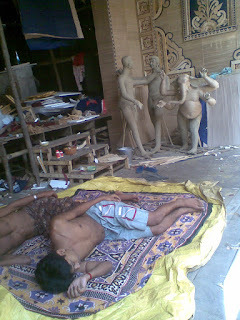 Today we went to Kumartuli to see the "Potter's Colony". Most of the galleries were empty since the idol has been shipped or in the process of shifting. In some of the studios artists were giving final touches. 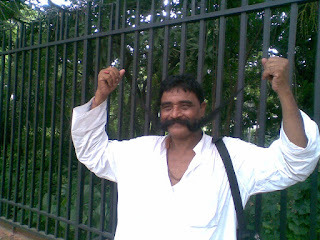 On 23rd , on Panchami we met the guy with the longest moustache in Kolkata while moving around Kolkata! On Panchami night ,we started our Pandal hopping by hiring an AC Mahindra and Mahindra SUV(@Rs 2000, which is quite low as per Puja standard. During puja it can go upto Rs 3000 - Rs 3200! We got the booking thanks to Upal's (works in M & M) client who is into car rental business (Khokan 9830 37 70 73 - from 9 p.m. to 6.30 a.m.) . We were supposed to leave at 9 p.m. , but ultimately we left at 10 p.m. thanks to great sense of timing by some of our group members! Our group consists of 9 people - Didi,Baba,Mohua,Babu (Mohua's borther) , Jola, Ms Chanda and her 2 sons. We had a great combination . Babu knowing all the lanes and by lanes and I am an expert on the artists of Kumartuli and the great Pujas! We saw creme de la creme of Kolkata Pujas. I.We started with Keyatala Puja which is part of CESC Telegraph True spirit Puja. 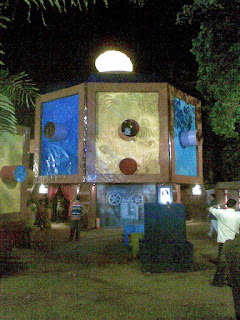 The theme was Kalighat Pat. II Our next stop was 95 Pally , which is on the right side after getting down from Dhakuria bridge. They made an amazing fort based on Ajmer fort - Lakshmi Vilas Fort. 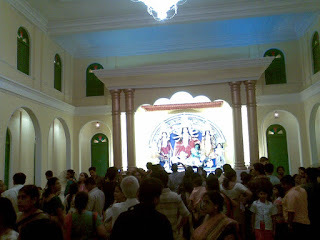 We skipped the Babu Bagan [BB] Puja to avoid standing in a queue. III Then we went to Jodhpur Park Puja. (We covered it [BB] later and was simply mesmerizing) Normally you have to stand in a queue for 20- 40 minutes to see the puja. Since it was Panchami, it was a cake walk! V Then we went to see the puja at Nashkar Para in Selimpur. 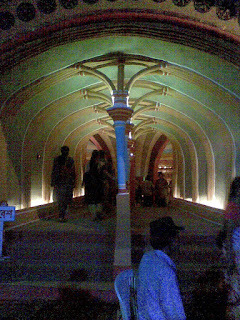 Since the roads were blocked we had to take the Jadavpur PS flyover to reach the Puja Pandal. 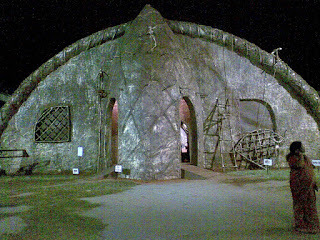 The theme of the puja was bioscope - whith pictures of filmstars and Directos of yester years inside. Then we decided to go to Haridevpur to see the famous pujas there. It is truly unbelieveable to say the least. 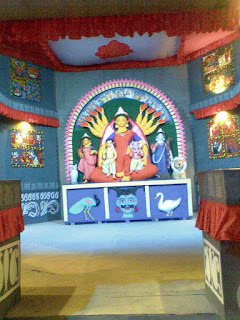 However, while going towards Haridebpur, we saw some beautiful pandals . XI , XII Then we went on to see Putiari Pally and Pallimanga Samity (both in Haridebpur), near a bylane of Ajeya Sanhati both of them are very near to Dipan house. XII Then we started moving towards Behala by taking a left turn from the bridge and took Karunamoyee Ghat road - BL Saha Road- Santosh Roy Road to finally reach James Long Sarani. We went to See the Puja organized by Shristhi. It was really interesting. By that time it is 3 .30 p.m.
We had to drop our office colleague at their Behala residence. On the way we some other nice ones too. After dropping them at their residence we lost our way and wasted some time. Then we went to see Adarsha Pally on Biren Roy Road. 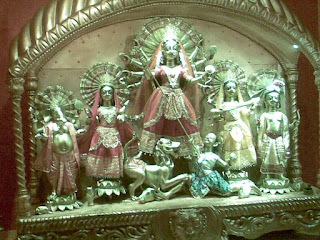 We planned to go to Behala Nutan Dal's Puja and Suruchi Pally. Since Didi was getting late so we had to skip it for the time being. We dropped Didi at her Prince Anwarshaw Road residence and went to see the puja on Prince Anwarshaw Road - they made Jorbangla of Bishnupur. Then we took the flyover near Garihat Police station to reach By pass and went to see famous Kasba Bosepukur Talbagan and Kasba Sitala Tala. Both of which are great work of art. But the one at Bosepukur would have been even better if we went their in the evening or night (when we reached their it was early morning), since the effect of light was very important in that one, to appreciate. Then it was time to return home and we reached home at around 7 a.m.
By 10.15 am I am back to office.Today, Sasthi, being last day of office it is very important for me to go there. But even after 2.5 months our tickets (waiting list 29,30) were not confirmed. I was dissapointed. Baba took Jola to Gopa mashi's house and show her the puja of Tridhara. So I decided to see the Durga puja in best possible manner! 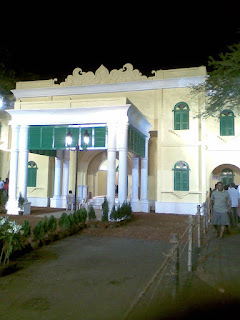 On Sasthi we made a walking tour to nearby places like Hindustahn Park, Samaj Sebi,Ballygunge cultural etc. 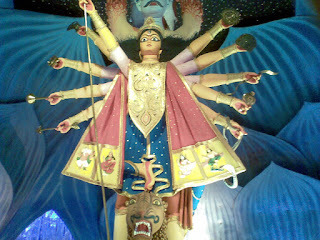 On Saptami we went to Sunil Nagar,Bondel Road, Mudiali,Shibmandir. 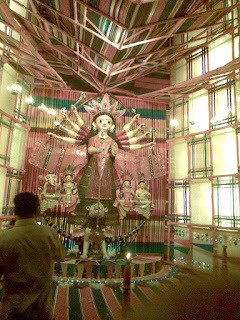 On Navami morning we(Jola,Didi and I) went to see Rajdanga Naba Udayan Club, which won Asian Paints award with Didi's car and once again saw Bosepukur's puja. Since Didi was getting late, we dropped her residence and we went to see Suruchi Sangha and Behala Nutan Dal. Near Behala Nutan Dal I saw my office colleague Chandranath. On Dashami morning we went to Jagadishpur's puja near Gariahat (puja of Baba's maternal house in Jagadishpur of Bangladesh). 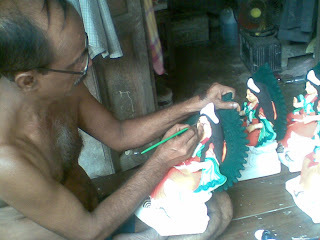 We met Dalkaku - he shown us some of the pictures of their(Thakuma) house in Bangaldesh , where this puja originally started. The name of the school is still in the name of Thakuma's father. He was the first judge over there(? 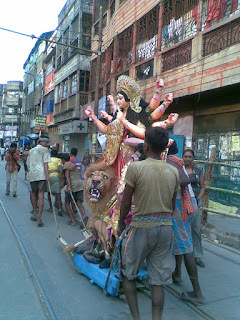 ).Mohua did her customary sindur khela there. Around 2.00 p.m. 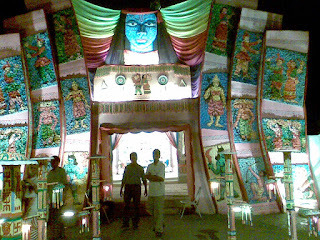 I left with Jola to see the amazing pandal of Babu Bagan. It was so good that Jola actually thought it is real. From there we went to Babu ghat to see immersion. Jola danced with one of the community puja members. It was real fun. In the evening we saw bhasan/immersion near our house. On Ekadashi we went to Sikim and Jola left for Sundarban. To know more read the Sikkim tour!